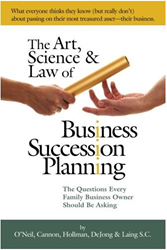 Recognizing family-owned business owners throughout Wisconsin have ongoing questions when it comes to selling and transferring ownership of their companies, the law firm of O’Neil Cannon Hollman DeJong & Laing has written The Art, Science and Law of Business Succession Planning. Will my key employees stay with the business rather than seek other employment? The law firm’s corporate and tax attorneys incorporated the latest changes to federal tax law into the inaugural edition of the book.